Start your order by clicking on a Merchandise category on the left. Prices are as of the date of the Catalog and reflect full retail price for the item. The prices do not reflect any special sales or member discounts. Prices also do not include Shipping and Handling. Customers should check the actual item in the web link to the left to determine the current retail price. Further, it should be noted that this Catalog is produced at unscheduled times throughout the year and may not reflect newly stocked items which are offered on this web site. It is always wise to check the merchandise categories to the left for any items you may be interested in, as well as the list of new items provided below. Society members get discounts on our products. Join and receive a discounted price on most items. Occasionally some item(s) may be excluded. Member Discounts - Our policy for purchases from the Company Store, fully explained. We recognize that it may not always be convenient for a customer to use this site to prepare a web based order. Therefore, we have provided a Manual Order Form that may be used to place an order. Sykesville MD 21784 Leave a message but please do not place an order. New Items Added this past year as well as any other recent changes. 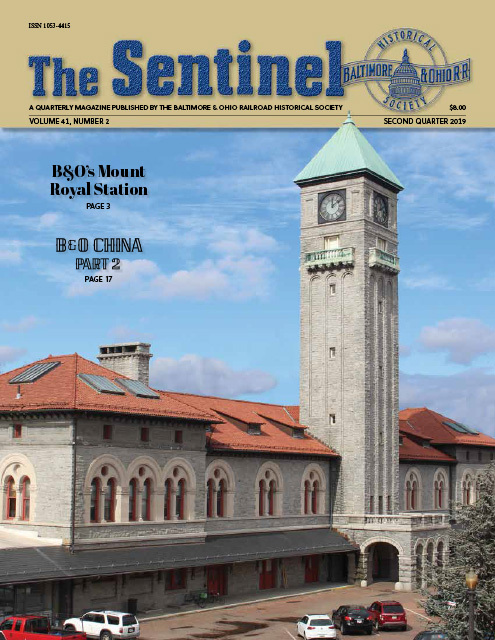 16APR2019 New Sentinel magazine- The 2nd Quarter, 2019 edition of The Sentinel has been published. Again this quarter, we have included a number of interesting historical short stories about America's favorite railroad - the Baltimore and Ohio Railroad. Please see page two of the following magazine link for an index of the topics included in this edition: Here is a low resolution copy of 6 pages from this edition. To purchase this edition, please see stock # 60412 in the Sentinel link to the left. 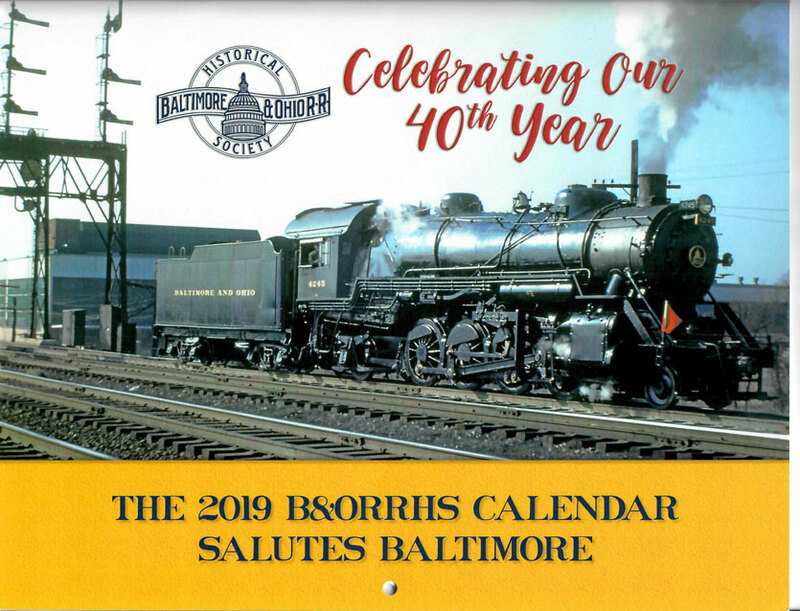 16APR2019 New Calendar- The 2020 edition of The B&ORRHS Calendar has been published quite early and is available for purchase. This year's calendar has no theme but covers a variety of locations with 15 color photos of steam and diesel with a couple of cabooses and a wreck crane. To purchase this edition, please see stock # 22020 in the Calendars link to the left. 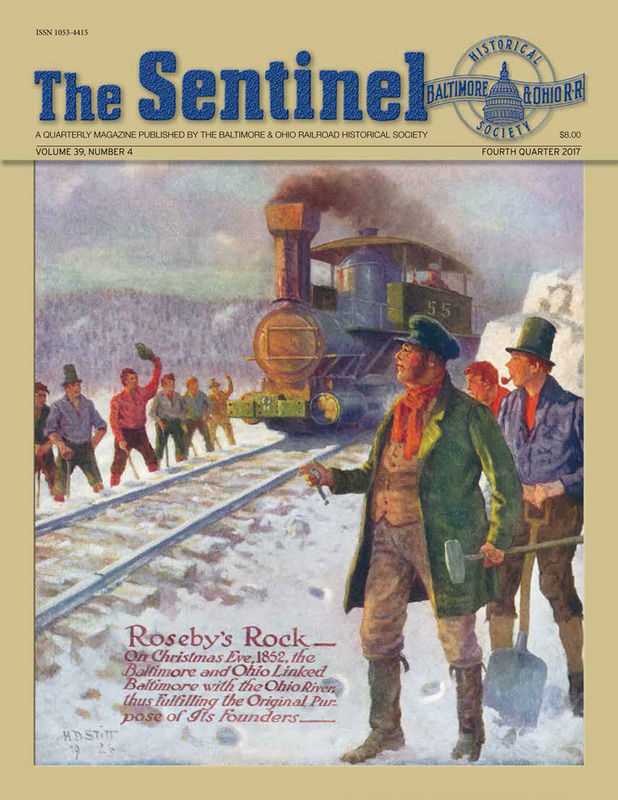 04JAN2019 Price Reduction- The price of each issue of the 2016 Sentinel has been reduced to $5. To purchase one of these items, please see stock # 60381-84 in the (The) Sentinel link to the left. 04JAN2019 Price Reduction- The price of the 2019 40th Anniversary calendar has been reduced to $10. To purchase this item, please see stock # 22019 in the Calendars link to the left. 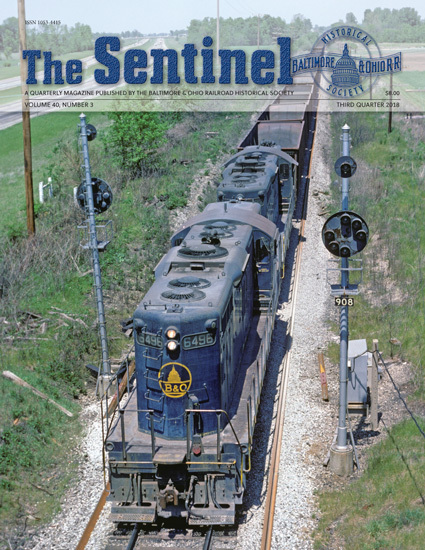 22DEC2018 Old "Sentinels" listed- A number of very old issues of the Sentinel and its Run Extra predecessors have been listed. Note that some are at severely limited quantitiy. To purchase these items, please see listings in the The_Sentinel link to the left. Also, several books have been removed from our offerings. If you are looking for an older book and cannot find it listed, it is no longer available. 21OCT2018 BACK in STOCK- The 2019, 40th Anniversary edition of The B&ORRHS Calendar is now available for sale in the quantity you want. 29SEP2018 Price Reduction- The prices of the Sentinel on CDs and the Modeler CDs have been reduced. The Sentinel CDs are now priced at $25. The Modeler CDs are now $8. To purchase these items, please see listings in the Videos and other Digital Media link to the left. These digital products are also listed under The_Sentinel and Models. 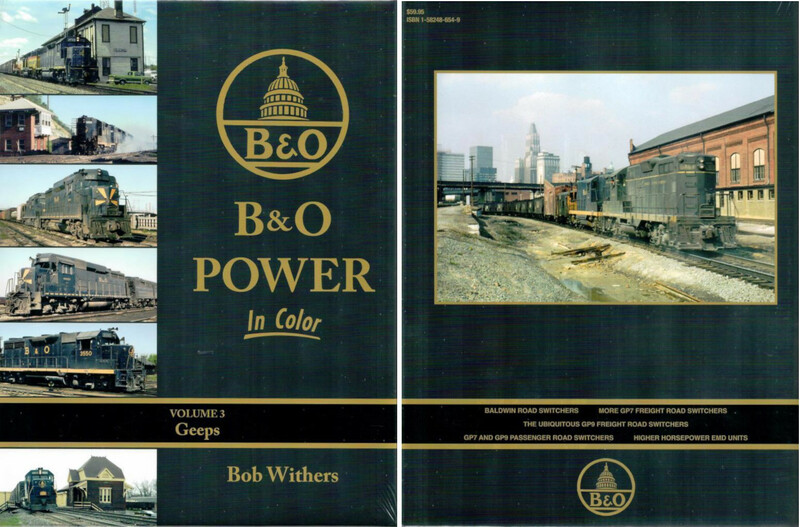 29SEP2018 New Book- "B&O Power in Color, Volume 3, Geeps", by Bob Withers. This Morning Sun book is the third and final in a series of all-color volumes to cover all diesels of the B&O. The subjects of this volume are the EMD GP's. The end pieces show reproductions of ads by EMD and Baldwin. To purchase this edition, please see stock # 10170 in the Books link to the left. 22JUL2018 New Sentinel magazine- The 3rd Quarter, 2018 edition of The Sentinel has been published. Again this quarter, we have included a number of interesting historical short stories about America's favorite railroad - the Baltimore and Ohio Railroad. Please see page two of the following magazine link for an index of the topics included in this edition: This image is a low resolution copy of 6 pages from this issue. 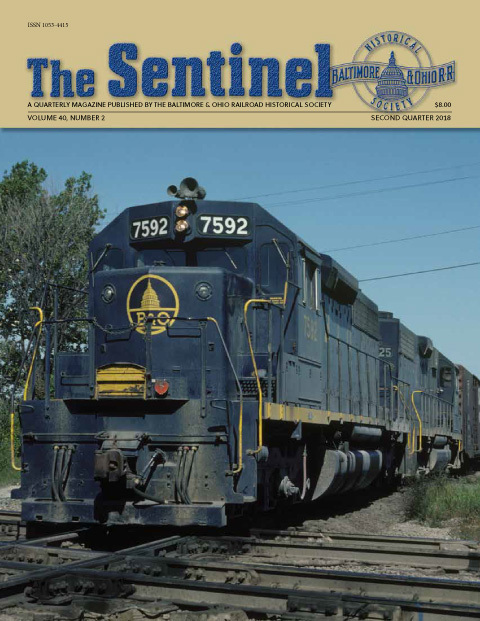 To purchase this magazine, please see stock # 60403 in the Sentinel link to the left. Price Reduction- The price of the 2018 calendar has been further reduced to just $6. To purchase this item, please see stock # 22018 in the Calendars link to the left. 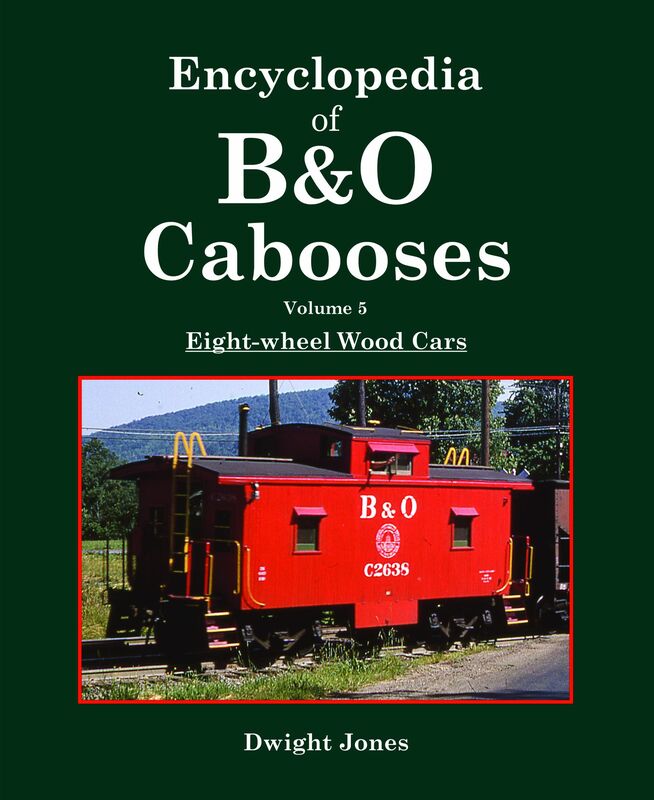 26JUN2018 New Book- "Encyclopedia of B&O Cabooses, Volume 5, Eight-wheel Wood Cars", by Dwight Jones. 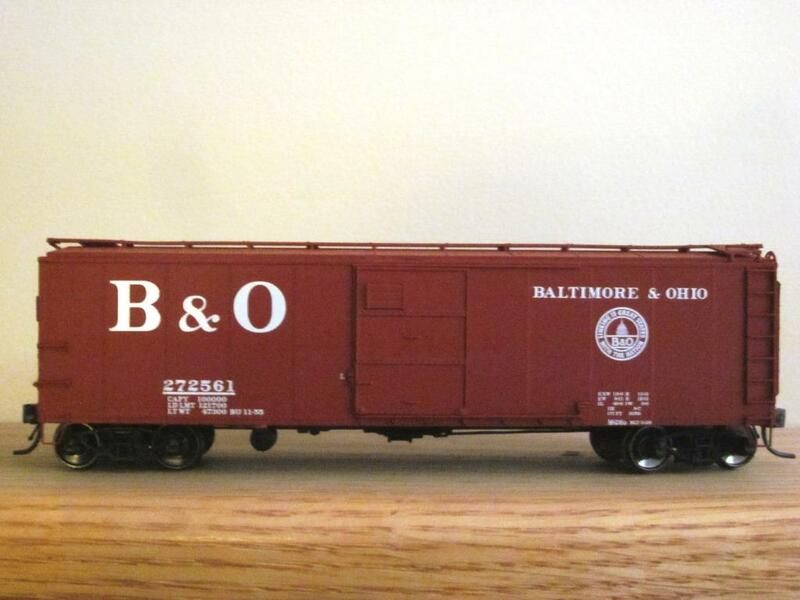 This is the 5th volume in a series covering all cabooses of the B&O. This book includes the I-1 to I-4, I-6, I-9, I-10, and I-14 classes. To purchase this edition, please see stock # 10169 in the Books link to the left. 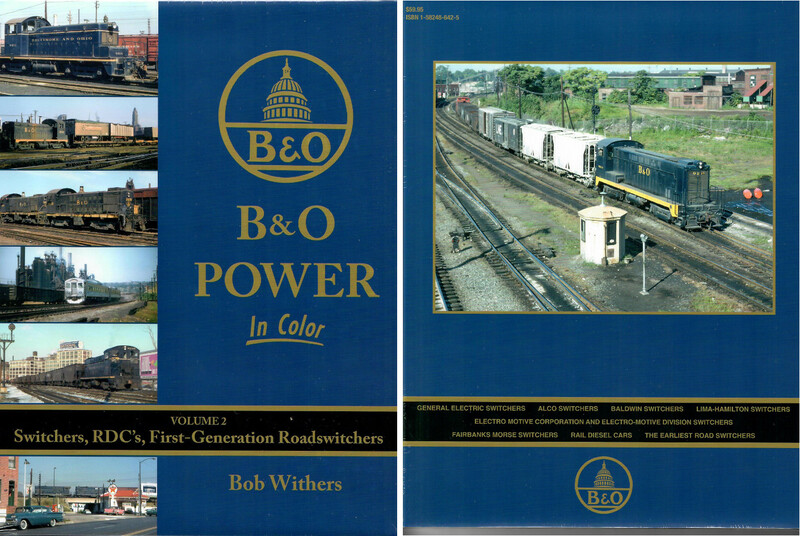 03JUN2018 New Book- "B&O Power in Color, Volume 2, Switchers and RDC's", by Bob Withers. This Morning Sun book is the second in a series of all-color volumes to cover all diesels of the B&O. The subjects of this volume are early switchers by ALCO, Fairbanks-Morse, and EMD; RDC's; and Roadswitchers. The end pieces list the entire diesel roster. To purchase this edition, please see stock # 10168 in the Books link to the left. 12APR2018 New Sentinel magazine- The 2nd Quarter, 2018 edition of The Sentinel has been published. Again this quarter, we have included a number of interesting historical short stories about America's favorite railroad - the Baltimore and Ohio Railroad. Please see page two of the following magazine link for an index of the topics included in this edition: Here is a low resolution copy of 6 pages from this edition. To purchase this edition, please see stock # 60402 in the Sentinel link to the left. 07DEC2017 New Model- Red Caboose M-26 Boxcar, Large Lettering, BLT 3-28 BU 11-55. Comes with Metal Wheels and Kadee Couplers. There are 6 road numbers to start. These cars are in quantities of only 1 or 2. Substitutions will be made unless you specifically check "No" for the Substitutions question on the order form. Orders with specific requests will not be accepted if any of these items is sold out. To purchase one of these models, please see stock # 33319 thru 33324 in the Models link to the left. 07DEC2017 New Model- InterMountain N-50 2-Bay Hopper. 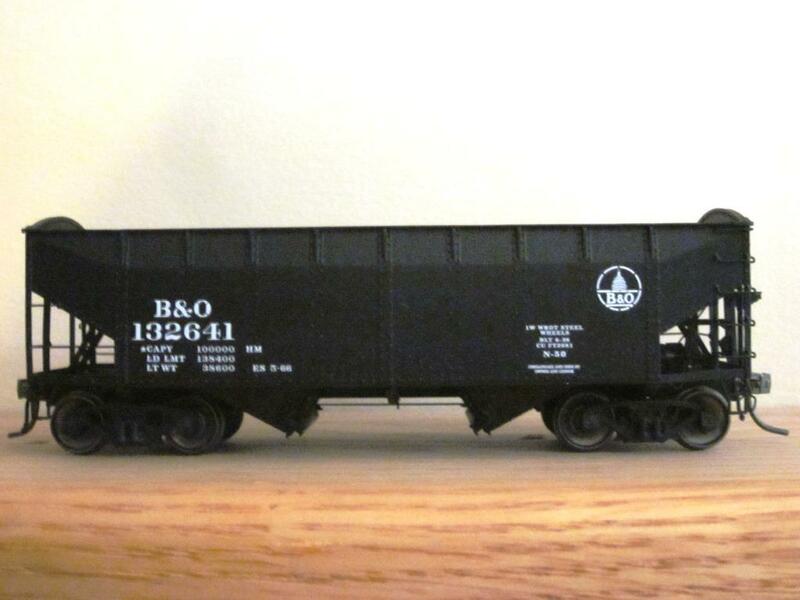 These cars came from from C&O and have a Dome Arch End with Capitol Dome, BLT 6-38 ES 5-66. There are 9 road numbers to start. These cars are in quantities of only 1 or 2. Substitutions will be made unless you specifically check "No" for the Substitutions question on the order form. Orders with specific requests will not be accepted if any of these items is sold out. To purchase one of these models, please see stock # 33601 thru 33612 in the Models link to the left. 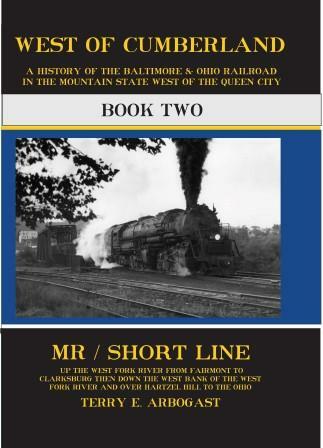 21OCT2017 New Book- "West of Cumberland, Book 2, MR / Short Line", by Terry Arbogast. Covers the B&O MR sub route between Fairmont and Clarksburg (with its beginnings as the Monongahela River RR) and the Short Line Sub between Clarksburg and Brooklyn Jct. The book is hardbound, comprising 488 pages on 100# coated paper (24pages in color), with 350 photos. It contains a history of the lines with information of their construction and of early wrecks. Many dozens of railroaders who ran over these lines were interviewed (over 100 pages in book). Detailed maps show the lines as they were in the 1920's. To purchase this book, please see stock # 10167 in the Books link to the left. 21OCT2017 New Sentinel magazine- The 4th Quarter, 2017 edition of The Sentinel has been published. 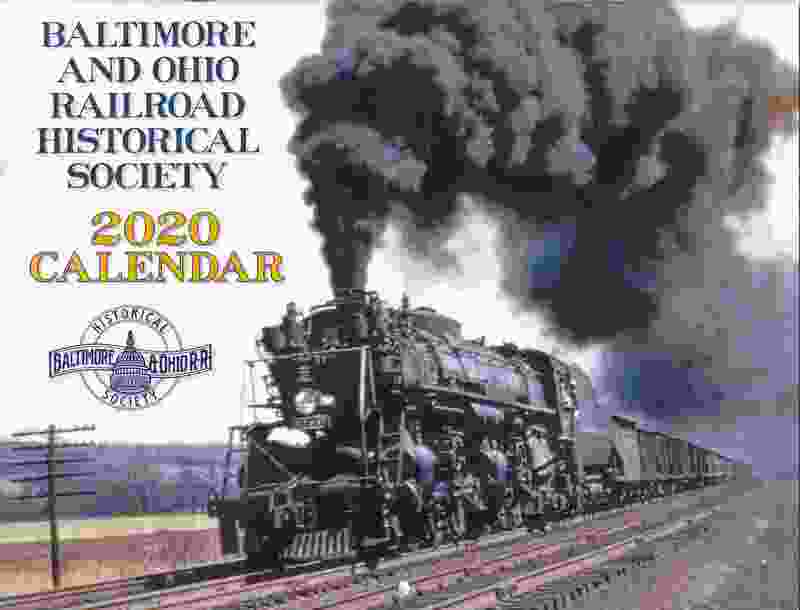 Again this quarter, we have included a number of interesting historical short stories about America's favorite railroad - the Baltimore and Ohio Railroad. Please see page two of the following magazine link for an index of the topics included in this edition: Here is a low resolution copy of 6 pages from this edition. To purchase this edition, please see stock # 60394 in the Sentinel link to the left. 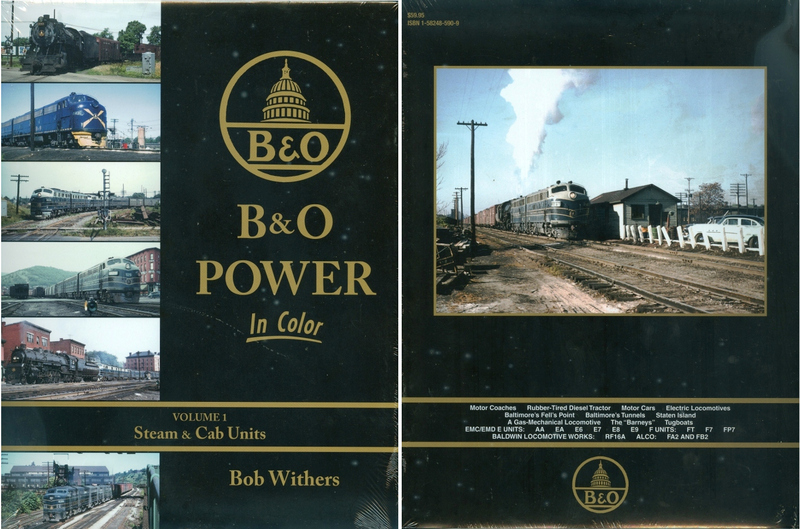 10AUG2017 New Book- "B&O Power in Color, Volume 1, Steam & Cab Units", by Bob Withers. This Morning Sun book is the first in a series of all-color volumes to cover all diesels of the B&O. There is also a section of photos of steam locomotive types on the road in the late '40s 'til the end of steam. A short section of the book shows other types of locomotion, such as electrics, motor cars, rubber-tired tractors, tugboats, and NYC motor coaches. The end pieces list the entire diesel roster. To purchase this edition, please see stock # 10166 in the Books link to the left.